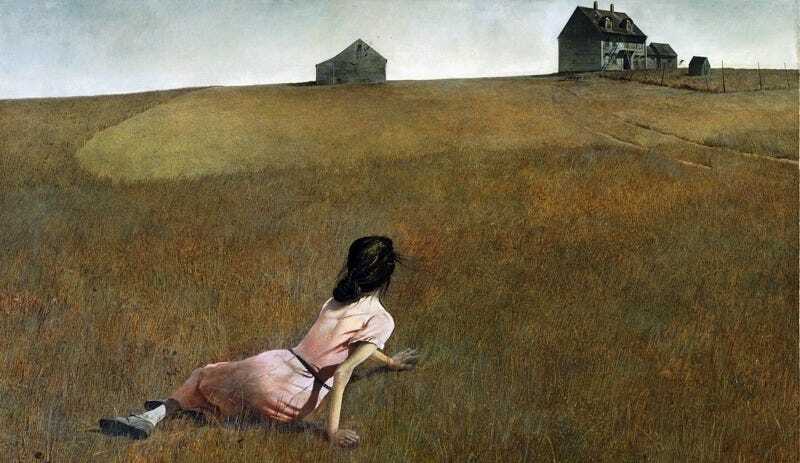 Andrew Wyeth’s “Christina’s World” (1948), part of the permanent collection of the Museum of Modern Art. The American artist Andrew Wyeth found inspiration for his most famous painting in a neighbor woman who suffered from a crippling, mysterious disorder that baffled her physicians. Now a child neurologist at the Mayo Clinic thinks he’s found the correct diagnosis. The woman in Christina’s World (above) is based on Anna Christina Olson, who lived near Wyeth and his wife Betsy in the summers and often served as the artist’s model, along with her younger brother. She was 55 at the time, and paralyzed below the waist. The artist watched her crawling across a field one day and was inspired to immortalize her on canvas. She died at 74. Neurologist Marc Patterson has done a bit of medical detective work, reviewing her medical history and studying the various Wyeth paintings for which she posed. He concluded that she suffered from early-onset Charcot-Marie-Tooth (CMT) disease, a group of inherited neurological disorders that target the peripheral nerves just outside the brain and spinal cord. He talked about his diagnosis earlier today at the 23rd annual Historical Clinicopathological Conference at the University of Maryland School of Medicine, devoted to diagnosing the ailments of historical figures. A nerve cell communicates information to distant targets by sending electrical signals down a long, thin part of the cell called the axon. In order to increase the speed at which these electrical signals travel, the axon is insulated by myelin.... Myelin twists around the axon like a jelly-roll cake and prevents the loss of electrical signals. Without an intact axon and myelin sheath, peripheral nerve cells are unable to activate target muscles or relay sensory information from the limbs back to the brain. CMT is caused by mutations in genes that produce proteins involved in the structure and function of either the peripheral nerve axon or the myelin sheath. Although different proteins are abnormal in different forms of CMT disease, all of the mutations affect the normal function of the peripheral nerves. Consequently, these nerves slowly degenerate and lose the ability to communicate with their distant targets. The severity of the symptoms and progression of the disease varies from person to person, but it affects both motor and sensory functions. The feet and lower leg muscles are usually weak, triggering frequent falls or constant tripping. The feet can become deformed, with overly high arches and hammertoes, while legs may bow into an inverted bottle shape. As the disease progresses, patients may struggle with smaller coordinated movements in the fingers, hands, wrists, and tongue.